Hello Emmett LeRoy here. I thought you would enjoy laughing with me and also at me as many of the Rural to Rural group like to do (specifically Alicia). As you may know I have a new found talent for making tea, but there has been an unforeseen side effect. That side effect being accidentally talking like a Brit. I imagine my teeth going crooked as I sip my tea tomorrow morning. Sue, other Alex (Alex R.), and I think its a bit bizarre, but not to worry as soon as I get a cheese burger and Dr. Pepper in me I should go back to normal. However, I digress, our project of the week is to repaint some buildings at the Nyamirama Primary School. We started off on Tuesday by prepping the building for painting, which included sanding and scraping the walls. 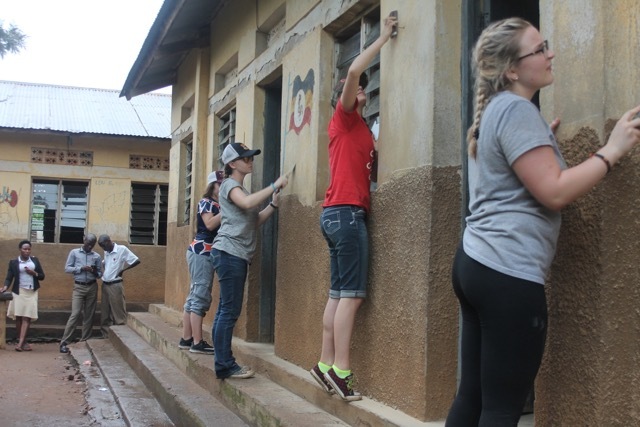 We continued our work the next day by painting the outside of the buildings. When it came to painting It was my turn to teach Main Alex (Tea Master) something. The roles had switched, teacher became pupil, grass hopper became master. As my brush touched the wall Main Alex knew he was in the presence of Picasso reincarnate. We finished the first coat of paint (I even let Main Alex paint a little) and completed our task for the day. We then traveled back to the lodge for tea.